Pisceans are complex and intuitive and navigate life's changing tides with ease. Pisceans are very creative, imaginative and love to experience the arts. They are inventive, compassionate and sympathetic and make life long friends. 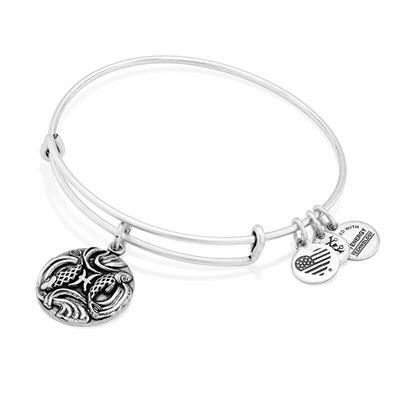 The charm hangs from Alex and Ani's Expandable Wire Bangle and is available in a Rafaelian Gold or Silver finish. Alex and Ani bracelets are made from recycled materials with a Rafaelian Gold or Silver finish. With powerful symbolism and infused with positive energy, these fabulous bracelets are the next big thing and already huge in America. The patented sliding mechanism makes the bracelets fully adjustable and perfect for stacking!